Annie Barrows is on tour! 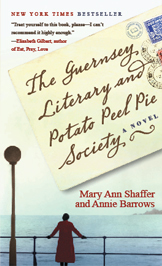 Come hear Annie talk and get your own signed copy of The Guernsey Literary and Potato Peel Pie Society! Enter for a chance to win a trip to Guernsey with your book club! Click here for details, official sweepstakes rules, and restrictions. No purchase necessary. U.S. residents over the age of 18 only. Residents of Florida, New York, and Rhode Island not eligible. All travel must be completed by December 31, 2009. Other restrictions apply. Is your book club discussing Guernsey? Click here to take a look at discussion guide questions. To celebrate Guernsey author Mary Ann Shaffer’s life-long commitment to writing, her family created the Mary Ann Shaffer Memorial Fund, which provided a scholarship at Soapstone, the Writing Retreat for Women, for an unpublished writer who has shown a serious commitment to writing. Soapstone offers women writers a stretch of uninterrupted time for their work and the opportunity to live in semi-solitude close to the natural world. Soapstone also provides the validation and encouragement necessary to embark upon or sustain a long or difficult writing project. Designate “In memory of Mary Ann Shaffer” on your check.